After years of declining interest rates, the Federal Reserve (the Fed) is raising rates at a faster pace due to a strong and growing U.S. economy. If the economy continues to perform as well as the Fed expects, rates may continue to increase at an aggressive pace. This accelerated rate forecast is prompting some investors to evaluate products suited to a rising-rate environment. For investors with the appropriate risk profile, commercial real estate (CRE) credit REITs may be a compelling option. CRE credit, or mortgage loans, are typically secured by income-producing commercial real estate properties. The types of properties may include office, industrial, retail, multifamily and hospitality properties. Income-producing means there are tenants in place paying the owner rent so that the owner has the cash flow to make monthly loan or mortgage payments. Some CRE credit products may make more speculative loans such as construction or land loans in return for higher income, and the risk of loss to the investor generally increases as the risk increases. CRE credit investments can be tied to a fixed or floating-rate, the latter of which allows interest rates on the loans to reset and keep pace with rising rates. 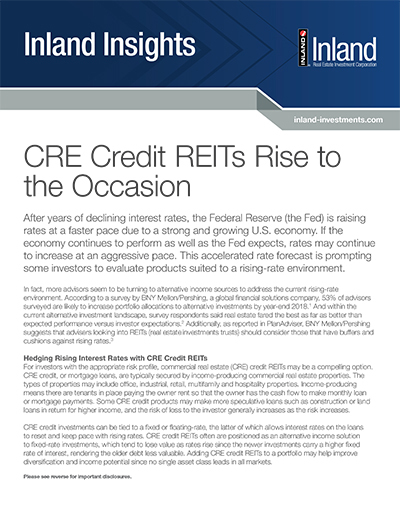 CRE credit REITs often are positioned as an alternative income solution to fixed-rate investments, which tend to lose value as rates rise since the newer investments carry a higher fixed rate of interest, rendering the older debt less valuable. Adding CRE credit REITs to a portfolio may help improve diversification and income potential since no single asset class leads in all markets. Some CRE credit investments can be confusing to investors because debt or credit can be associated with borrowing. In this case, the CRE credit REIT serves as the lender. These types of products primarily originate loans that are in a senior position within the capital structure. 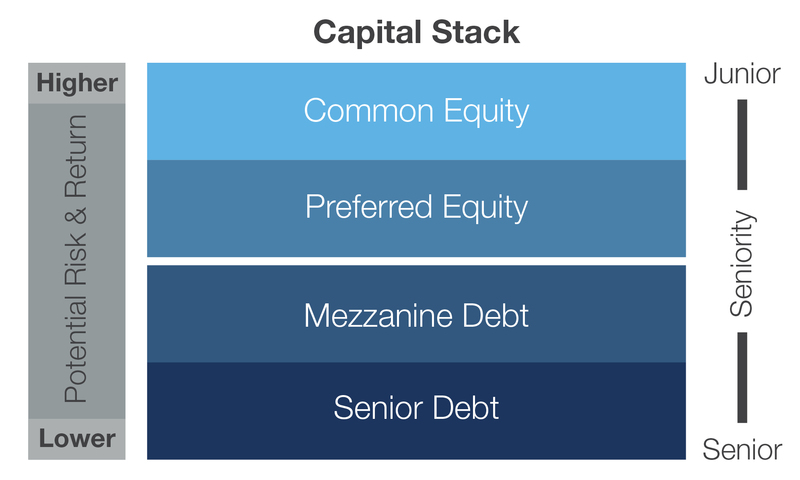 So, in addition to their ability to keep pace with increasing interest rates by using floating rates, the debt investments are more senior to equity. If property values drop, the equity portion may lose value, but the borrower frequently continues to make loan payments to protect their equity position. However, CRE credit REITs are subject to default risk, which means the borrower may stop making loan payments, and that would negatively affect the performance of the loan. So, while credit is senior to equity in the capital structure, it does not prevent CRE credit REITs from suffering losses. Nonetheless, commercial real estate loan losses have averaged 0.65% per quarter over the last 25 years. Loan losses have historically only spiked in major financial crises and loans have performed well through up and down economic cycles. The good news for retail investors is that many alternative strategies that were traditionally only available to institutions and accredited investors are now becoming more accessible to all investors. Alternatives, such as CRE credit REITs, have drawbacks as well as benefits, so it is important to understand all the risks prior to investing to determine how alternative strategies may fit into a long-term portfolio. 1 BNY Mellon | Pershing. The Alternative Advantage: Is Now the Time to Take a New Look at Alternative Investments? 2018. The paper focuses on three largely illiquid alternative investments: nonlisted REITs, private equity vehicles and hedge funds. 2 Preqin Investor Outlook. Alternative Assets H1 2018. 3 Alternatives Seen as a Panacea for Volatility. PlanAdviser. July 16, 2018. 4 Board of Governors of the Federal Reserve System: Charge-Off and Delinquency Rates on Loans and Leases at Commercial Banks. (http://www.federalreserve.gov/releases/chargeoff/chgallsa.htm). Federal Financial Institutions Examination Council (FFIEC) Consolidated Reports of Condition and Income (1991-2017: FFIEC 031 through 034; 2001-2017: FFIEC 031 & 041). There is no guarantee that market conditions will continue or be profitable. the risks typically associated with real estate assets, such as changes in national, regional and local economic conditions, local property supply and demand conditions, ability to collect rent from tenants, vacancies or ability to lease on favorable terms, increases in operating costs, including insurance premiums, utilities and real estate taxes, federal, state or local laws and regulations, changing market demographics, changes in availability and costs of financing and acts of nature, such as hurricanes, earthquakes, tornadoes or floods. Some of the risks specifically related to investing in a nonlisted REIT include but are not limited to: there is limited liquidity because shares are not bought and sold on an exchange; distributions cannot be guaranteed and may be paid from sources other than cash flow from operations, including borrowings and net offering proceeds; and conflicts of interest with, and payment of fees to, affiliates. The Inland name and logo are registered trademarks being used under license. This material has been prepared by Inland Real Estate Investment Corporation (Inland Investments) and distributed by Inland Securities Corporation,member FINRA/SIPC, dealer manager and placement agent for programs sponsored by Inland Investments and Inland Private Capital Corporation, respectively.